An ANSI pump can be defined as an overhung impeller, end suction, single stage, centerline discharge, centrifugal pump. ANSI pumps can be both horizontal and vertical designs. This type of pump is so designated as an ANSI pump because it fits the dimensional and operational criteria and requirements of the ASME B73 – 1991 pump specification. 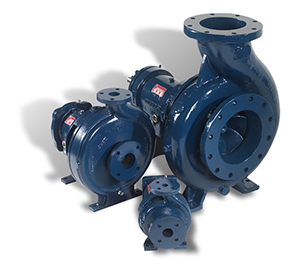 ANSI pumps are covered by a standard that requires all such pump types to be dimensionally interchangeable and to have certain design features to facilitate installation and maintenance. This standard requires that all ANSI pumps, regardless of the pump manufacturer, be interchangeable with respect to mounting dimensions, size and location of suction and discharge nozzles, input shafts, baseplates, and foundation bolt holes, etc. Therefore, the ANSI pump standard provides a good minimum set of requirements when purchasing new pumps. It is important to select the right pump for your application. For information to help you find the correct pump for your application, we've included the Pump Application Manual. It includes useful information on pump terminology, types of pumps available and how to apply the correct equipment for your pump application. We've also included the Pump Safety Handbook for details on safely applying pumps. Click to view the Griswold ANSI Pump Interchangeability Guide for Griswold 811 & Goulds 3196, 3796 & 3996.